The Gaucho Grill makes it official in West Covina this Thursday, but it’s a far cry from its former self. The Argentine restaurant used to be a staple throughout the 1980s and 1990s, with locations that stretched across the LA basin. The West Covina outlet is the second Gaucho Grill to open this year with the same name, but with an entirely revamped menu, look, and ownership. Older Angelenos might recall Gaucho Grill’s former massive menu, which included everything under the Argentine sun. The new menu is stripped down and easier to navigate, down to the generous cuts of ribeye, short rib, and filet mignon, as well as the empanadas, milanesas, salads, and protein-filled sandwiches. 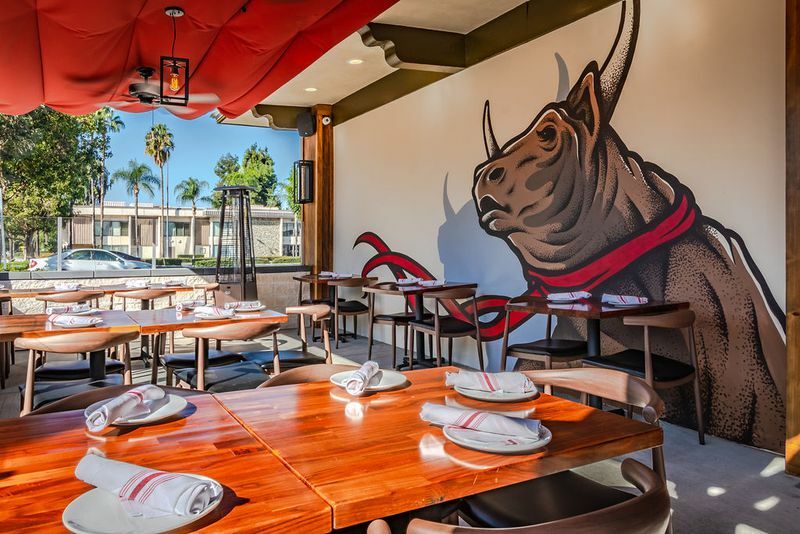 Since taking over the brand in 2015, owners Adrian Amosa and Kirk Cartozian seem to have carried Gaucho Grill into 2018. The partners took a few years to rework everything. Gone is the dark, minimalist look with clunky tables, and expected food choices. The partners opened the Downey location earlier this spring, then spent almost six months transforming the 3,200 square feet former Chinese restaurant space in West Covina. Buenos Aires-born Amosa started working with Gaucho Grill in 2008. A trying period for most industries, Amosa watched large restaurants rapidly fold as the economy suffered and tastes changed. Even the Brentwood Gaucho Grill location closed in March 2018. The previous owner passed Gaucho Grill into Amosa’s hands, then partnered with real estate broker Cartozian to help lead the restaurant’s new charge. Interestingly, the Gaucho locations in Downey and West Covina are adjacent to new and forthcoming Porto’s Bakeries. As of Thursday, Gaucho Grill hours are Sunday-Thursday from 11 a.m. to 10 p.m., Friday 11 a.m. to 11 p.m., Saturday 11 a.m. to 11:30 p.m.
“Gaucho Grill Reimagines Itself Into a Modern Day Argentine Steakhouse.” Eater LA – All. https://la.eater.com/2018/11/7/18073024/gaucho-grill-modern-steakhouse-southern-california.